Employees in all branches of CJSC Bai-Tushum and Partners throughout the whole Kyrgyzstan honored veterans of Great Patriotic War in the remarkable holiday – Victory Day.Great Patriotic War is a significant event in our history, it is our common past. Bai-Tushum and Partners company always remembers it and tries to support financially and morally those, who once performed a deed, sacrificed themselves so that we could enjoy our lives and peaceful sky above us. This is not only a part of the social mission of Bai-Tushum and Partners company, aimed at supporting socially vulnerable layers of population, but also a tribute of gratitude to our dear veterans of World War II, as well as a tribute to those who bravely gave their lives for our bright future. 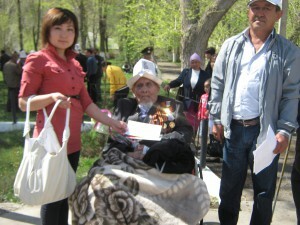 Within the greetings action in Bishkek, Bai-Tushum and Partners provided charitable assistance to veterans, residing in Lenin and Sverdlov districts, also to members of the Society of disabled people in Lenin district and to “Frontoviki Otechestva” public association. As for the regions of the republic, company provided its assistance to veterans of the World War II and home front workers who live in the cities of Osh, Batken, Naryn, Karakol, Talas, Jalal-Abad and other regional centers of the country. Thus during this charity event 329 veterans and home front workers were honored. This year, the company has decided to support veterans in form of cash in amount of 1 000 soms each. Based on the needs of veterans, the food packages were also delivered. Gifts were presented and personally delivered at the city events, organized by local state administrations.